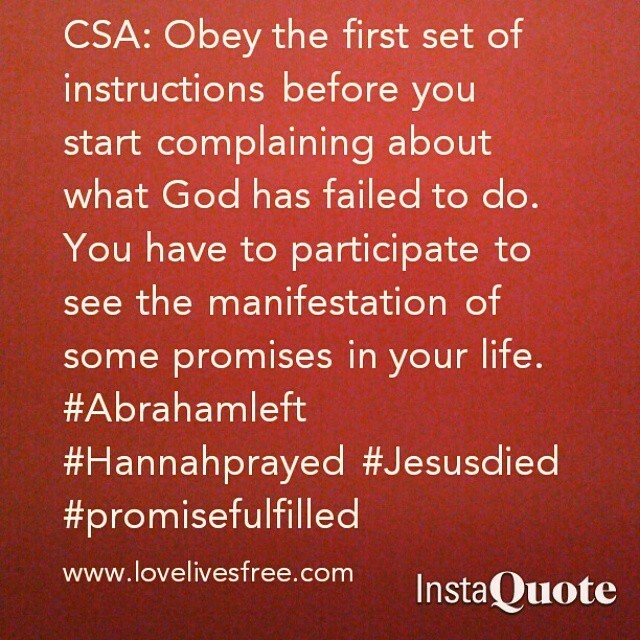 Obey the first set of instructions before you start complaining about what God has failed to do. You have to participate to see the manifestation of some promises in your life. As I sat with this thought, three people came to mind: Abraham (Gen. 12-25), Hannah (1 Samuel 1), and Jesus (Philippians 2:8-11). In order for Abraham to become the Father of Many Nations, he had to leave his hometown. In order for Hannah to receive her son, she had to pray like a drunken women before those in the temple. Jesus had to die on the cross, in order to obtain the name above all names. All three of these people had one thing in common, they participated in the promise. They went where they were instructed. They abandoned their comfort zones. And one gave up his life in order to experience the manifestation of the promise. Sitting with this discovery of my disobedience, I had two options available to me. I could soak in self-condemnation, or I could repent and start fresh. I opted for the latter. I asked God to forgive me for accusing Him of being a liar. I acknowledged that my disobedience has been the hold up in reaching my dreams. I repented for comparing my position in life with others; and I asked the Holy Spirit to help me redirect my focus on the assignment God has for me.